Stephen Hyde and Kaitie Keough win Sho-Air US Cup-CX series, demonstrating the strength of their Cannondale team. LOUISVILLE, Kentucky (VN) — Stephen Hyde and Kaitie Keough won overall titles in the Sho-Air US Cup-CX Saturday, demonstrating the strength of their Cannondale-CyclocrossWorld.com team. Plus, Cannondale’s Emma White finished second in the women’s classification. 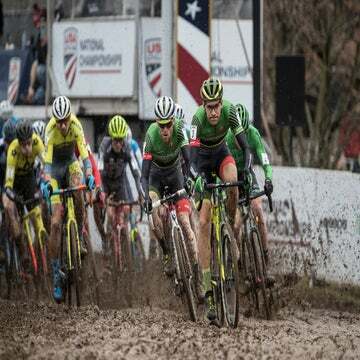 It was the inaugural edition of the series and the first national-level cyclocross series since the U.S. Gran Prix of Cyclocross folded in 2013. Ahead of the final race, Hyde had the men’s series all but locked up with a 70-point lead. 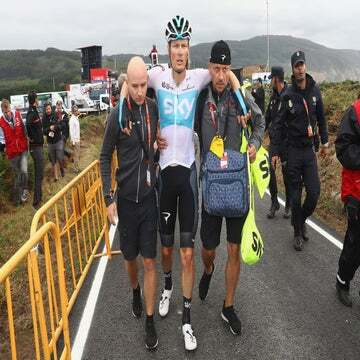 He simply had to earn one point by finishing 25th or better. The national champion could not have done any better in the final series race, winning the day and the $12,500 check as US Cup-CX series champion. The battle for second and third, however, was tight. Kona’s Kerry Werner was merely 20 points up on Hyde’s Cannondale-CyclocrossWorld.com teammate Curtis White. Tobin Ortenblad (Santa Cruz-Donkey Label), who raged through the first two weekends of the US Cup, was only six points off the podium. With his fourth-place finish in US Cup-CX/Derby City, Ortenblad moved past White for the third spot on the podium. Werner stayed second in the series with his third-place result Saturday. His payout was $3,000; Ortenblad took home $2,000. Like her Cannondale teammate, Hyde, Keough was in command prior to the Derby City Cup, holding a 25-point advantage on Emma White, who also wears Cannondale green. Aspire Racing’s Ellen Noble was not far behind. She went into the weekend only five points out of second place. Noble was also keeping an eye on fourth place Rebecca Fahringer, who was 11 points out of the money. “My number-one objective was to just try to make sure I didn’t botch the series or anything like that,” Keough said. There weren’t any shake-ups in the final women’s standings with Keough, White, and Noble finishing first through third, respectively. Keough was second to national champion Katie Compton Saturday. Noble was fifth, and white was ninth in the Louisville race. The women’s series payout was equal to the men’s. Riders were enthusiastic about the first running of the US Cup-CX series.